Burrows Engineering Racing rider Davey Todd is aiming to return to full fitness as soon as possible after sustaining some minor injuries following a crash in the Superbike race at the Ulster Grand Prix on Saturday. Davey had been holding fourth position on the Suzuki GSX-R1000 at the end of the opening lap but unfortunately crashed out at the Deer’s Leap on lap two. Fortunately, Davey did not suffer any broken bones in the incident, although the 22-year-old was feeling battered and bruised afterwards. The Saltburn-by-the-Sea rider had earlier clinched an excellent fourth place in the Superstock race and felt confident of challenging Conor Cummins for the final rostrum position when the race was red-flagged. Davey retired from the Supersport 600 race with a slight issue on the CBR600RR Honda while in contention for a top-six finish. On Thursday, Davey finished fourth in the opening Supersport race and qualified third fastest for the Superstock race on the front row. He also set the fifth fastest time in qualifying for the Superbike class, underlining the terrific progress he has made this year with the Dungannon-based team. Racing was later abandoned at Dundrod on Saturday due to inclement weather conditions. Davey’s next scheduled race with the team is at the East Coast Festival at Killalane in September, which is the final Irish National road race of the season. “Davey had an off at Deer’s Leap on Saturday but thankfully he was fine. He’s very lucky because I know myself as a former rider that it’s not a place where you want to have a crash. We had a worrying time as a team waiting on news to come through about Davey, but it was good news in the end. The wind was very strong on Saturday and that seems to have been a contributing factor. “Davey said he hit the same marker and braking point as always, but he just wasn’t able to turn into the corner at the top of the Deer’s Leap. It was a racing incident and it is part and parcel of racing, but thankfully we have come out the other side. 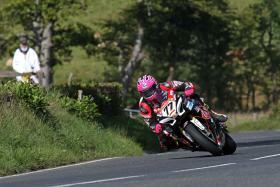 “Overall, it was a brilliant Ulster Grand Prix for Davey and the team. He finished fourth in the Supersport race on Thursday and qualified on the front row for the Superstock race. On Saturday, he was feeling comfortable behind Conor Cummins in the Superstock race until the red flag came out and felt confident of challenging for the podium, but fourth was still an excellent result. “I’m relieved to get away with one after crashing on Saturday. I think it was the wind that caught me out because I didn’t do anything different than I had done on every other lap, but I just seemed to run wide. I’ve no broken bones, so I’m really grateful considering where I came off. I have a few minor fractures, some ligament damage and quite a lot of stitches, but all in all I’m not too bad. “I’ll try and get back to full fitness as quickly as possible and if anything, I think I’ll come back stronger. I’ll learn from this and we’ll do what we can to come back stronger next time.